Tropics are (insert trite phrase here). Well, they are active. Summary for 30 August 2018. In the Atlantic, “Potential Tropical Cyclone Six,” as NHC is presently calling it, is an organizing tropical wave that has just exited the coast of Africa. Here is what the GFS model thinks it is going to do, it will probably be called “Florence” by this evening, and is on the fast track to become a hurricane by this weekend. Carry around a seltzer bottle and squirt the first person who talks about its chances of hitting the US; it’s on the other side of the ocean right now! 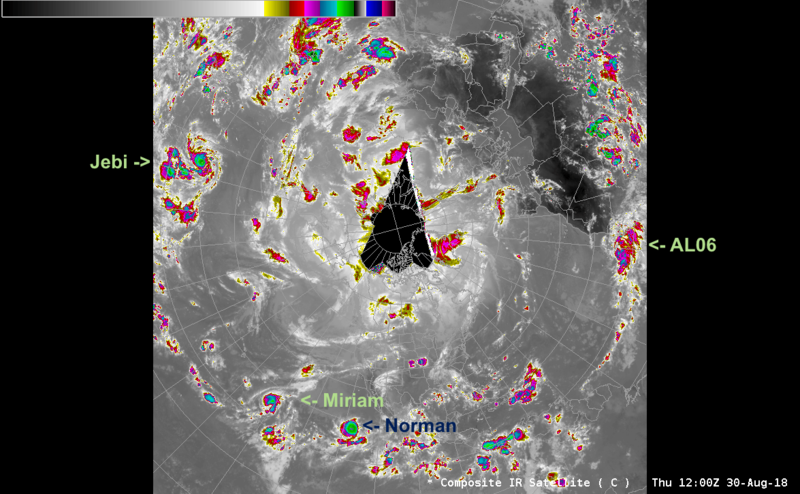 In the Pacific, Norman is a mature hurricane making waves off the coast of Mexico, headed west. Not a threat to anything for at least a week, and probably not then either. Miriam gave the folks in Hawai’i a bit of a nervous fit, given what just happened with Lane, but it is turning north and likely to die in cold water. The main threat to land right now is Typhoon Jebi, which is headed towards Japan. Japan has been hit with multiple very rainy tropical systems this year – last count I saw was over 300 dead from flooding, thousands homeless. They really don’t need this, hopefully this forecast is off and it will turn offshore. Lane has deteriorated to an exposed low level circulation, with all the main convection hundreds of miles to the east – unfortunately, still over the islands of Hawai’i. Things should hopefully start to clear out later today, although there is a big area of convection still moving over the region. 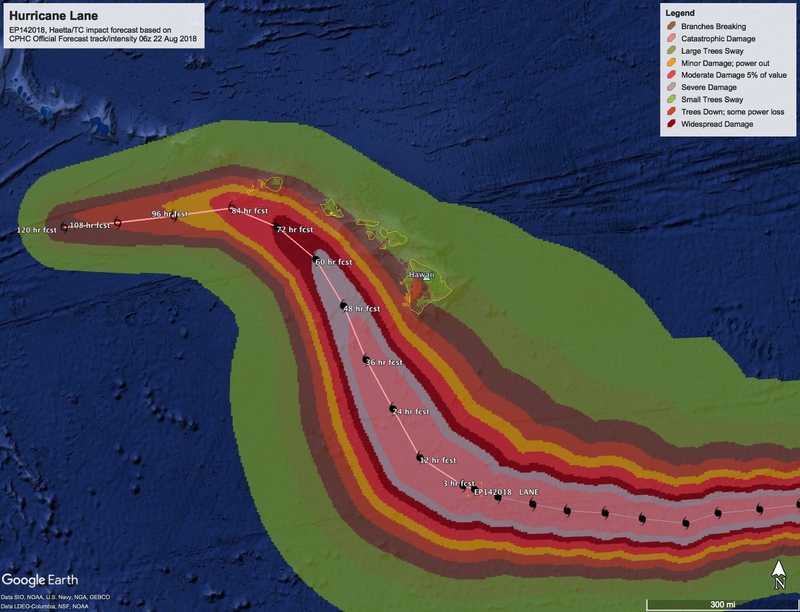 Rain has been historic in places, and the Big Island hit hard with flooding, but all of the islands have seen a lot of rain, and there is ongoing risk for flooding on the already hard hit (from floods this spring) island of Kaua’i. Here is an InfraRed satellite view from 7:30am east coast time (1:30am Hawai’i time). Lane will virtually disappear today, but may come back in a couple of days as an extratropical system of some kind. … but in fact, the center of circulation is well offshore. Here is the same image, but with the winds from the surface to 5000 feet in yellow, and the winds at about 24,000 feet in blue. Lane should continue to fall apart over the next day or so as it drifts away from the main Islands. It might become an extratropical storm in a few days. 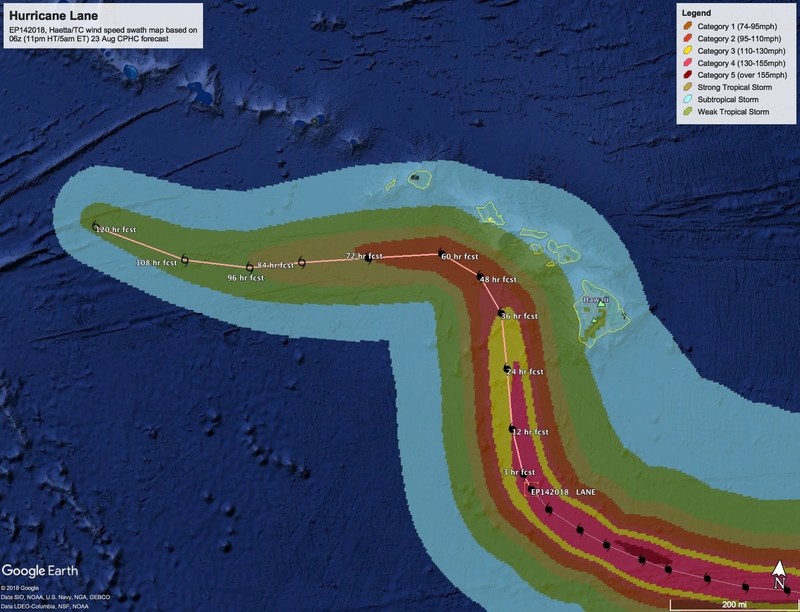 In any event, rain will continue to fall on the islands of Hawai’i for at least another day, with flooding the continuing danger. Damage from the storm will likely be mostly from floods, with some scattered impacts from trees down and power outages. 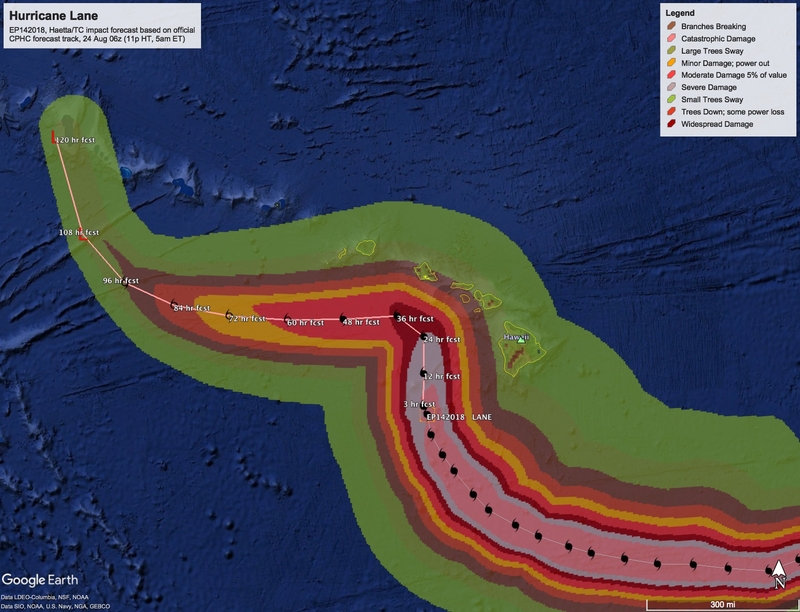 Some of the flooding is already catastrophic, and parts of the Islands (Kaua’i for instance) have been drenched already this year and will likely see further damage. But if you aren’t in a flooded area this storm probably didn’t seem so bad. Overall impacts currently estimated in the $100 Million range – but flood impacts are much harder to model than wind, so that’s a pretty iffy number. 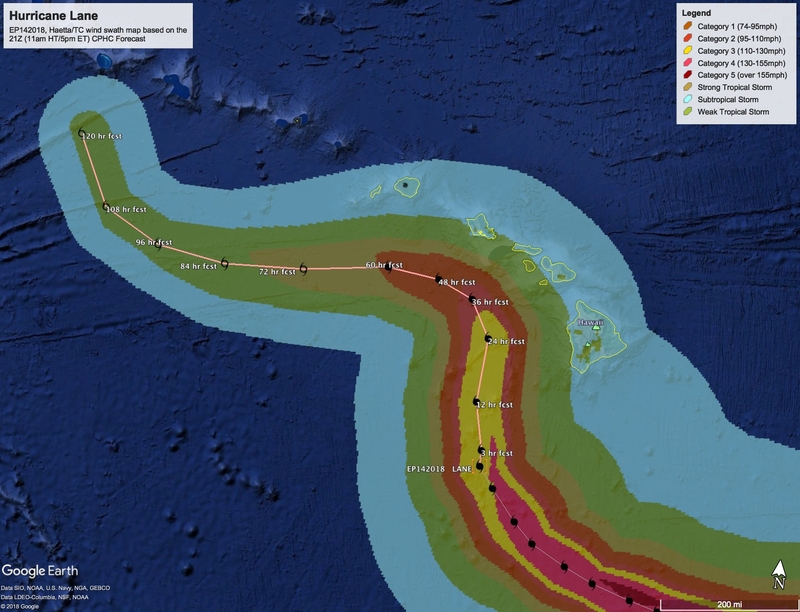 CPHC did a good job with this one – difficult scenario, with a strong storm headed towards a heavily populated Island. 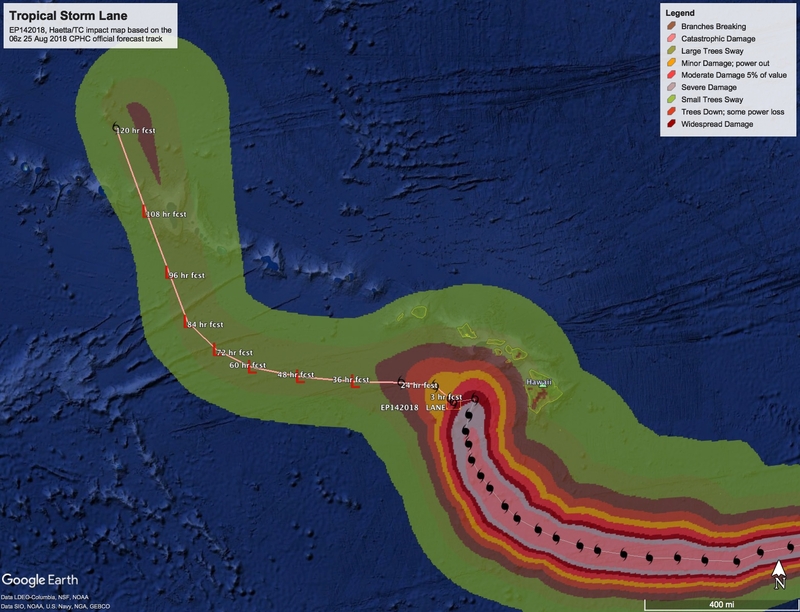 Although the metoerology was pretty solid that Lane would not make a direct hit on O’ahu and turn away, still had to be nerve-racking because this is complex stuff with lots of uncertainty. I didn’t have much of a chance to check any of the media coverage from Hawai’i. What I did see here on the mainland was mostly of the “their gonna die, lets talk about politics” variety. Sigh. 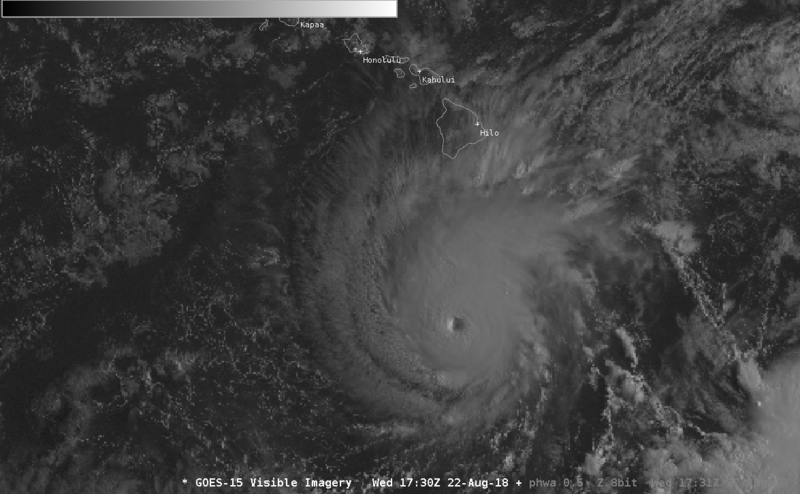 Here’s a sunrise visual band image of Lane – eye is no longer visible as it continues to weaken, now a Category 2, should continue to fall apart in the shear. 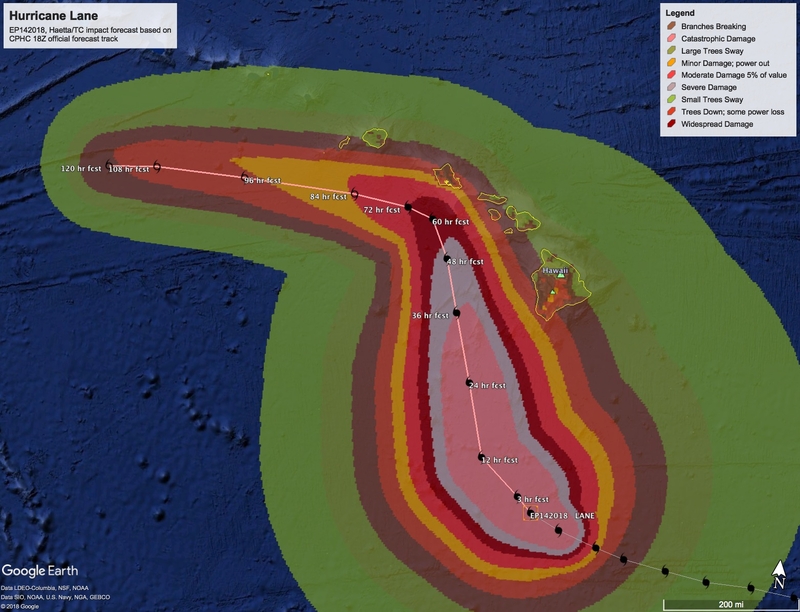 Although there is some risk Lane will hit O’ahu as a Category 1 hurricane tomorrow, it seems much more likely to turn at the last minute, and wind was not really the big risk from this storm, it was/is rain. There is serious flooding on the big island, the question now is how much will fall on the other islands. Here’s the current (12:30pm ET/6:30am Hawai’i) radar composite. Not the clear banding you think of from hurricanes, but that’s deceptive. The storm isn’t moving very fast, so bad conditions should persist through Saturday. Those cells can dump a huge amount of water as they are forced “upslope” by the terrain, causing massive runoff and flash floods. Bottom line is that if you are near a stream or river, or a place that floods (or right on the shore), this is a serious, life threatening storm. Otherwise, it’s probably still much more likely to be a power outage and pick-up-limbs-and-debris after it passes kind of storm. The Central Pacific Hurricane Center is probably a very sweaty smelly place these days 🙂 Hurricane Lane is following the forecast track so far, but it is swinging dangerously close to the Islands. Here is the latest forecast impact swath based on the 24 August 09z CPHC forecast, which is 11pm the 23rd Hawai’i time and 5am East Coast Time the 24th. Not much has changed in the last few cycles other than tweaking the intensity and exact track. CPHC is being a bit conservative (high) with the intensity, but it’s a smart move given how close the storm is passing, how warm the water is, and how organized the storm remains despite a lot of wind shear. 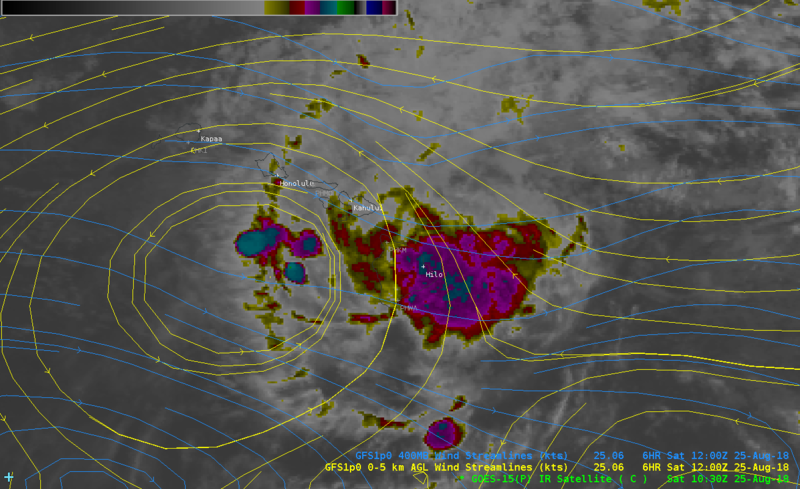 That shear will change direction radically over the next day, forcing a hard left turn as the storm approaches O’ahu. Scary stuff. Assuming the storm makes the turn as forecast, in most places impacts will be in the “hazardous to be out in it but not catastrophic” range, except in flood prone areas; see below. The higher winds should stay offshore. Not to say it won’t get gusty, and higher winds across the higher ridge lines, but wind damage should be limited to limbs and weaker trees down, damage to signage, roofs and awnings, that sort of things. Could be lots of power outages, but nothing catastrophic unless something breaks that shouldn’t. The biggest risk from Lane continues to be rain and flash flooding in the mountains and streams/rivers that run off from them. Some areas have had nearly two feet of rain over the last day – all that water gets channeled through valleys and can cause epic, fast moving floods. More on that in a separate post. 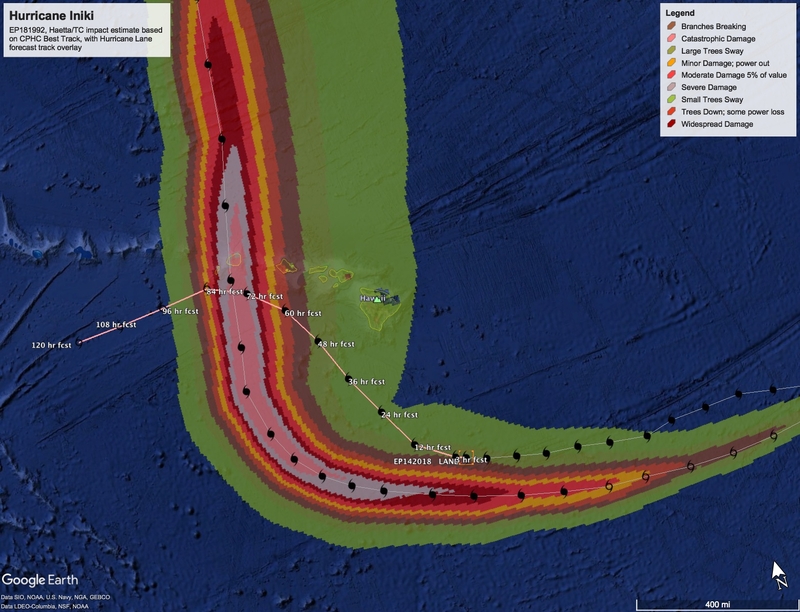 On this track impacts are likely to be in the $100 Million range across the islands. But as noted, this is a tough storm to get a handle on as small wobbles can either spare the islands – or smash them.